Celeste Parker is used to hearing scary stories about werewolves—Legend’s Run is famous for them. But when, after an unnerving visit with a psychic, she encounters a pack of wolves and gorgeous, enigmatic Brandon, she must discover whether his transformation is more than legend or just a trick of the shadows in the moonlight. Brandon may be Celeste’s hero, or he may be the most dangerous creature she could encounter in the woods of Legend’s Run. 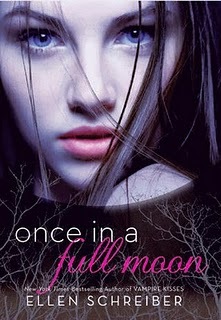 The bestselling Vampire Kisses author, Ellen Schreiber, weaves together psychic predictions, generations-old secrets, a town divided, and the possibility of falling in love with a hot and heroic werewolf—the perfect formula for what happens...once in a full moon. Just looking at the cover alone made me want to read this one. The cover looks dark and intriguing, which contrasts with the lighter tone of the book. Once in a Full Moon reminded me a lot of Vampire Kisses. It had a perky heroine, mysterious love interest, friends who don't understand the heroine's interest in the mysterious/bad boy, and clueless parents. This book had a slightly middle-grade tone to it, which is good for younger teens, but the lighter feel did not appeal to me as a thirty year old woman. The development of the love story was innocent and sweet. I enjoyed this book, but I feel okay ending the series here. If the next book in the series was available on NetGalley or the library, I would definitely read it, but I don't think I'll be seeking it out actively. The book just felt so young to me. It was a fun, happy read. Ooo good to know (about the younger tone)! Thanks for the review. I might check this one out at some point, but I won't be rushing to get it. I like the cover too! I have this one on my e-read (from NetGalley), so I'm planning on reading it soon. This will be my first time reading Ellen Schreiber, so we'll see how it goes! Thanks for your thoughts! Interesting. I'm drawn to the book the same way you were, because of the cover which kind of makes it seem like it would be for an older YA crowd because of the provocative look the girl giving. Sorry it didn't feel right for you. With so much on my TBR list, I think I'll pass on this one. Thanks for your review, it really helped. How did the book feel MG to you? Did the main character seem overly naive? Or was the plot too simple? It's funny, because it looks like it's meant to be a YA from the cover. I like your honest review! I got this one from NetGalley too. I haven't read it yet. But it's nice to know about the younger tone. I read Vampire Kisses by Schreiber and I liked it. However, that one is has a younger feel to it, as well. Alison---it is meant to be YA but I'm thinking this author writes in a younger tone. Her book Vampire Kisses also is YA but felt younger to me. It's the light-hearted tone that makes this book feel young. The heroine is almost empty-headed, at least that's how she felt to me.